F Hampus Gustafsson (Regina, Brandon, 2009-11) signed a one-year contract with Grenoble (France, Ligue Magnus) after a successful tryout. This season, he has three goals and an assist in two games with Grenoble. He started the season with Pantern Malmö (Sweden, Division 1) and was pointless in three games. Student-athletes or employees or independent contractors . . . or something else altogether? 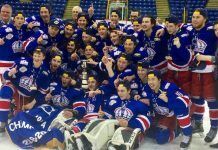 Just what are major junior hockey players? That is at the crux of a class-action lawsuit that was filed Friday in Toronto. 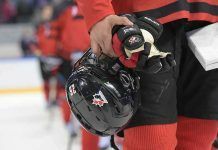 The statement of claim is looking for $180 million from the Canadian Hockey League and its 60 teams. 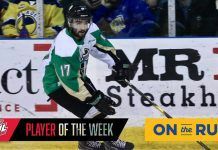 The lawsuit claims that the CHL pays its players less than the minimum wage in various jurisdictions and that these players should also be eligible for vacation and overtime pay. Cribb’s story is right here. Later Monday, David Branch, Gilles Courteau and Ron Robison, the three men who head up the CHL’s three leagues — the OHL, QMJHL and WHL, respectively — issued a joint news release. 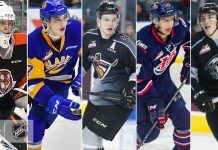 For the last few years, the CHL and its member leagues and teams have gone to great lengths to claim that their players are student-athletes, and you can bet that will be at the crux of their defence, should it come to that. However, we’re a long, long way from that point. This, then, is Step 1. The speed at which the Canadian legal system works dictates that this action could take years to reach a conclusion, assuming that it proceeds that far. The chances of it getting that far are, of course, awfully slim. The last thing the CHL wants to do is have its teams’ books opened for public perusal. Still, it is going to be interesting watching this play itself out. There was one humorous bit to the news release issued by Messrs. Branch, Courteau and Robison. The Gumbleys, it seems, are bothering the CHL the way the mosquito in the cartoon raises havoc in the nudist colony. While the CHL tries to let on that the Gumbleys aren’t a bother, its arm are swatting furiously in an attempt to drive them away. As is always the case in these situations, the CHL has instructed its teams not to comment on the filing of the lawsuit. 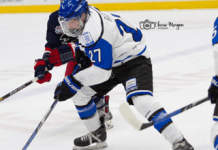 Brandon Archibald, a native of Port Huron, Mich., who played four-plus seasons in the OHL, has written an essay providing his perspective on what it’s like playing major junior hockey. He also addresses why he chose the OHL over the NCAA route. That piece is right here. Bruce Gordon played three seasons in the WHL (Medicine Hat, Saskatoon, 1979-82). Eventually, he spent 28 years in law enforcement, most of that with the Saskatoon Police Service. He retired two years ago. 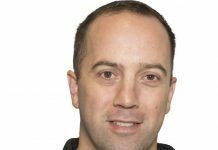 Now, at the age of 51, Gordon is a student in the U of Saskatchewan’s college of law. . . . Jason Warick of the Saskatoon StarPhoenix has more right here. John Chartrand, a former OHL and QMJHL goaltender, is suing the OHL’s Barrie Colts for $12 million, claiming that he was wrongly cleared to play shortly after being knock unconscious in a car accident. Rick Westhead of TSN reports on the lawsuit, that actually was filed on Dec. 12, 2012, right here. Jeremy Roenick says he experienced 13 concussions during his playing career. Now the former NHLer admits to having memory loss, some slurred speech and, at times, difficulty finding the right word. . . . Aaron Taube of businessinsider.com has more right here. 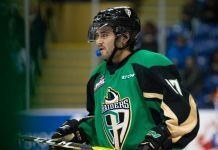 The Red Deer Rebels have acquired F Tyler Sandhu, 18, from the Everett Silvertips in exchange for fourth-round selections in the 2015 and 2016 bantam drafts. . . . Sandhu was a second-round selection by the Portland Winterhawks in the 2011 bantam draft. Everett acquired him as part of the deal in which D Seth Jones went to the Winterhawks. . . . Sandhu, from Richmond, B.C., had 33 points, including 19 goals, in 62 games as a freshman (2012-13) with Everett and added 30 points, 13 of them goals, in 49 games last season. . . . This season, he has one goal in nine games. . . . 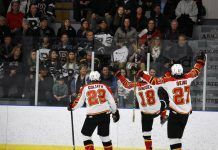 This will be the first of what no doubt will be a number of moves by Brent Sutter, the Rebels’ owner, general manager and head coach, aimed at strengthening his roster with the ultimate goal being the 2016 Memorial Cup, which will be held in Red Deer. Patterson’s story is right here.